Volunteering is a universal human value that can be found in all societies. In southern Africa, for example, the concept of Ubuntu defines the relationships of mutual assistance between people. In Norway, the word dugnad describes a traditional system of cooperation. In the Arab world, the word tatawa'a represents voluntary assistance to others. In Niger, the word samariya is used to express the voluntary commitment of young people to community-based activities. In our various experiences, we all know a traditional form of volunteering. Volunteering and South-South Cooperation share common ideals that make them perfect partners: solidarity, respect and equality. Both have an opportunity to derive mutual benefit from their alliance. The landscape of international volunteering, like that of international cooperation, has changed immensely in the past decades. Today’s programmes are no longer limited to the participation of traditional donor countries of the North. Indeed, recent years have seen new volunteer organizations born across the Global South. Since 1987, the Nigerian Technical Aid Corps has been sending volunteers to provide technical assistance in countries of Africa, South America, the Caribbean and South-East Asia. This is also the case for the White Helmets of Argentina, which since 1994 uses their volunteers as a tool to respond to disasters and strengthen resilience abroad. Both are perfect examples of this emerging model for international cooperation. On the one hand, volunteering is a resource for sustainable development since it allows men and women to participate in the development of their own community. Through volunteering, citizens build resilience, enrich their knowledge and enrich a sense of responsibility for their own community. We know that individual and collective voluntary action strengthens social cohesion and trust which contribute to sustainable development by and for citizens. On the other hand, South-South and triangular cooperation is a framework of collaboration between developing countries based on the desire for solidarity, mutual exchange of experiences and expertise. Its unprecedented role in the landscape of international cooperation for development and innovation in the South is generating new tools and partnerships designed to solve the problems of peace and development. These issues are increasingly relevant to the dynamics of development and are essential points for facilitating national ownership and localisation of the Sustainable Development Goals (SDGs). At the United Nations Volunteers (UNV), we have included South-South and triangular cooperation as a priority in our new Strategic Plan 2018-2021. Firstly, we facilitate such exchanges through the mobilization of UN Volunteers, 82% of whom come from the Global South. We also coordinate the exchange of experiences concerning volunteer programmes between countries and provide support and expertise to those that request it. UNV also enables online volunteering, including the setup of online volunteering platforms that can be used to strengthen collaboration. Through these services, we strengthen national volunteer corps by helping create them and, above all, we build networks that augment the impact of volunteering around the world. UNV is a partner of choice for articulating the role of volunteerism across development issues and the national achievement of the SDGs. We work with Member States and our partners to support all countries that wish to integrate the contributions of volunteers into their national SDG strategies. By combining volunteerism to South-South and triangular cooperation, together, we will achieve these goals. --- This story has been originally published in the Huffington Post. Mr. Olivier Adam is the Executive Coordinator of the United Nations Volunteers (UNV) programme. 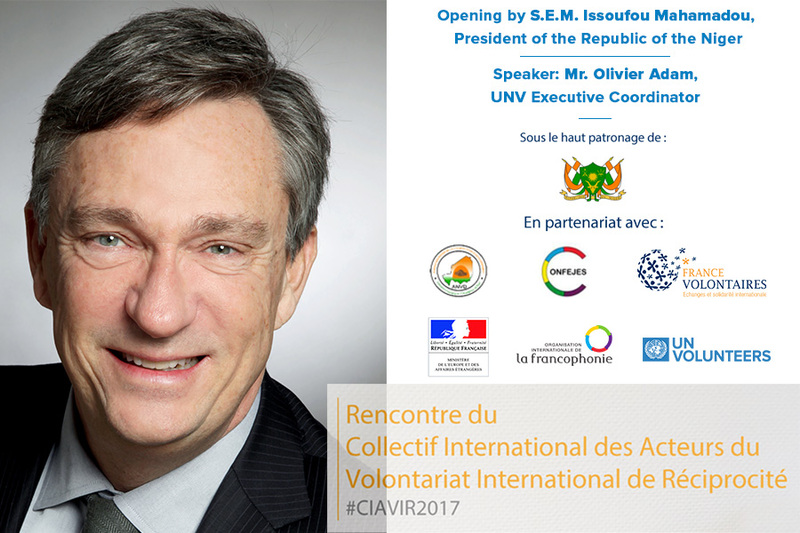 He participates today in the 2nd Cooperative Workshop of the Actors of the International Volunteering of Reciprocity held in Niamey, Niger.